Elon Musk: Falcon Heavy Launch Could Kick Off "A New Space Race"
At 3:45 p.m. ET yesterday, February 6, SpaceX successfully launched Falcon Heavy, the most powerful rocket in the world. Minutes later, its two 16-story-tall side boosters executed a synchronized landing back at Cape Canaveral, though the fate of the rocket’s center core remained up in the air. A few hours later, SpaceX CEO Elon Musk cleared up the center core mystery during a press conference about the Falcon Heavy launch, in which he also detailed SpaceX’s next steps. According to Musk, the center core did make its way back to Earth — just not onto SpaceX’s autonomous drone ship like it was supposed to. Two of the engines used to slow and guide the core didn’t fire as expected, causing it to just miss the ship. This took out two thrusters and showered the deck with shrapnel when the core hit the Atlantic Ocean at approximately 482 kph (300 mph), Musk told reporters. The loss of the center core was the only blemish on the day. 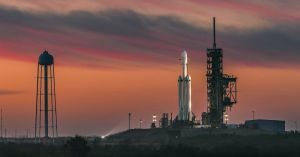 Everything else about the Falcon Heavy launch went as hoped, and SpaceX is already looking forward to how that success could shape the future of space exploration. As for “bigger and better,” Musk told reporters SpaceX is now turning their own attention to the BFR, the “big f**king rocket” system they hope to use to send humans to the Moon, Mars, and even on quick hops across the Earth. “There are a lot of uncertainties around this program, but it is going to be our focus,” Musk said during the press conference. He noted that he hopes to conduct a “full-scale test” within three to four years. It looks like the rest of the world will be racing against Musk himself to take the title of most powerful rocket away from Falcon Heavy.